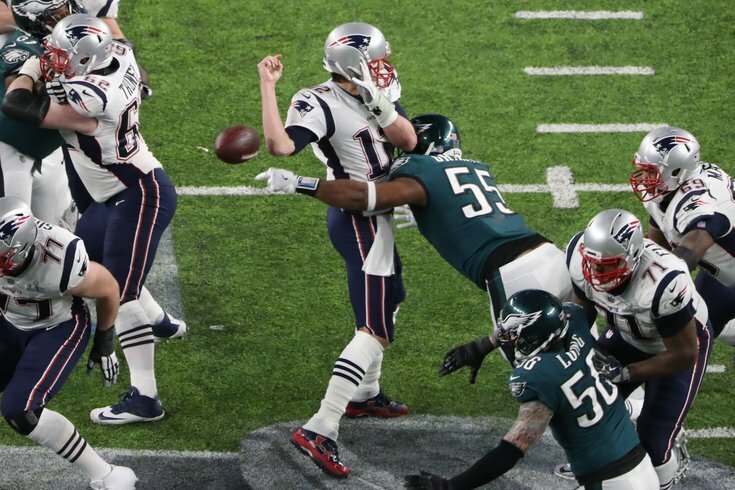 New England Patriots quarterback Tom Brady fumbles the ball as he is hit by Philadelphia Eagles defensive end Brandon Graham during the fourth quarter in Super Bowl LII at U.S. Bank Stadium. MINNEAPOLIS — His left hamstring was bothering him, and each time the trainer was examining it on the Eagles’ sidelines during the first half of Sunday’s Super Bowl LII, Brandon Graham would wince. The Eagles’ defensive end wasn’t about to let anyone else know the pain he was going through. He wasn’t about to be consumed by the frustration of getting so near to Tom Brady he could hear him breathing just before he completed another pass. Graham, the Eagles’ 2010 first-round draft choice, was bound to make a play, he thought to himself. He knew it. With 2:16 left to play, Graham made the kind of play that Eagles’ fans will be talking about for generations, when Graham came crashing in from Brady’s right side after blowing through New England right guard Shaq Mason to strip Brady. Defensive end Derek Barnett pounced on the loose ball and that one single play made it possible for the Eagles to nail down their first Super Bowl, beating New England, 41-33. Until then, nothing the Eagles did defensively was working. New England had scored on its first three possessions of the second half, amassing 613 yards of total offense. Brady had directed three drives of 75 yards each to put the Patriots up for the first time, 33-32, with 9:22 left to play. “We knew we were playing Tom Brady and that coaching staff and they had a great game plan in the second half,” Graham said. “The offense carried us the whole game and the defense had to make a stop. At the end of the day, we kept coming. I did get hurt a little bit. I hurt my hamstring a little bit. But you know, I didn’t want to come out. Graham described the sack as beating his man, Mason, one-on-one, the Eagles secondary took away Brady’s first read and that enabled Graham to swat the ball away. “I didn’t know the ball came out until Derek Barnett picked up the ball,” Graham said. “The next thing you know, we were coming off the field. All game we were one step away, one step away. But we knew Brady would make plays. Like I said, we didn’t get frustrated. We just kept coming. One of these plays, Brady was going to hold the ball and we wanted to make sure were going to be there. It turned to be the play — and statement — of a lifetime.